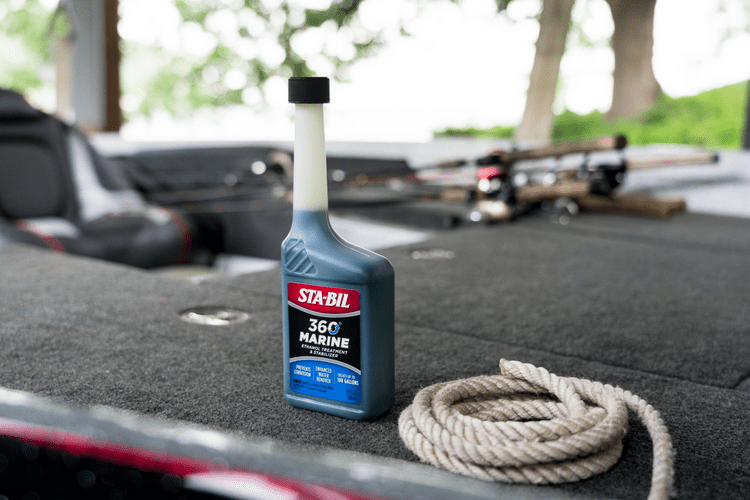 STA-BIL 360˚® MARINE™ – use it with every fill up to help keep your engine running cleaner, leaner, smoother and stronger than ever. 1oz treats up to 10 gallons (38 liters) of fuel​. Product does not contain alcohol. Perfect for use in all boats, jet skies, and other watersport engines. 5-IN-1 MAXIMIZER HELPS TAKE PERFORMANCE OVER THE TOP. PREVENT ETHANOL DAMAGE: Protect your entire fuel system against damaging rust and corrosion caused by moisture and ethanol fuels. Provides a protective coating on ALL the metal parts of the entire fuel system and combustion chamber, even when the engine is not running. INCREASE POWER: Strip away carbon buildup, gum and varnish that can inhibit engine performance, and get the most out of your fuel by burning it more completely. Bring back the power your engine once knew. 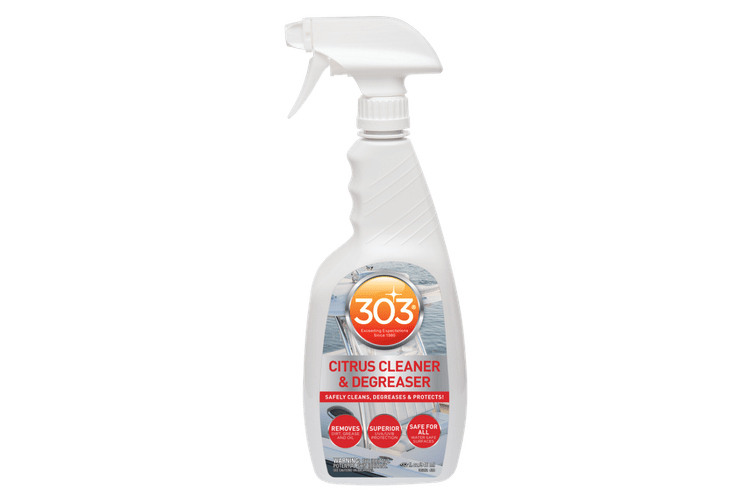 Clear and prevent harmful gum, varnish and buildup throughout the combustion chamber and injectors. MAXIMIZE FUEL ECONOMY: Burn fuel more completely and efficiently by preserving the fuel system and engine. 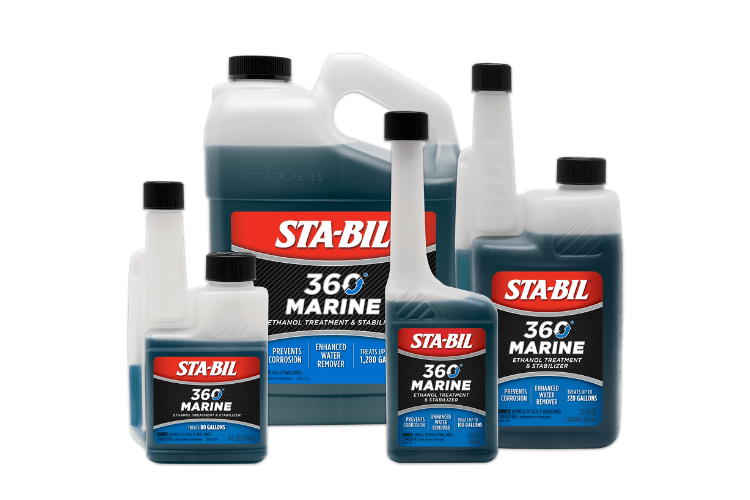 HOW OFTEN SHOULD I USE STA-BIL® 360°™ MARINE? In marine equipment you use frequently, STA-BIL 360° MARINE should be used AT EVERY FILL UP for ultimate, year round protection against corrosion. If your boat is in storage, one use of the product will stabilize the fuel for up to 12 months (if added to fresh fuel). 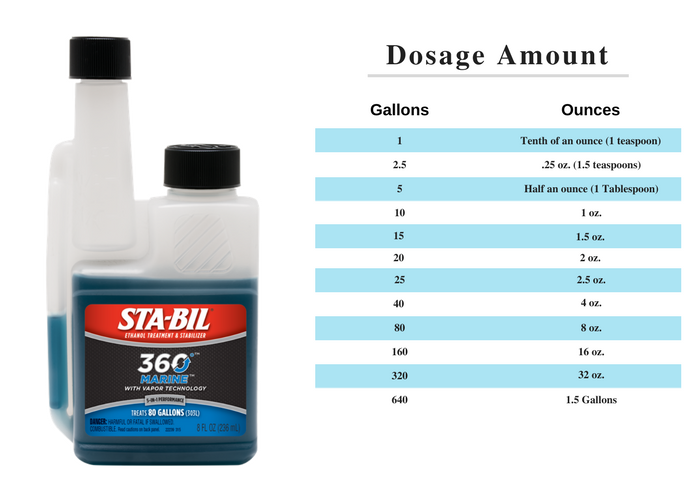 HOW MUCH FUEL DOES ONE BOTTLE OF STA-BIL 360°™ MARINE TREAT? One 12 oz. 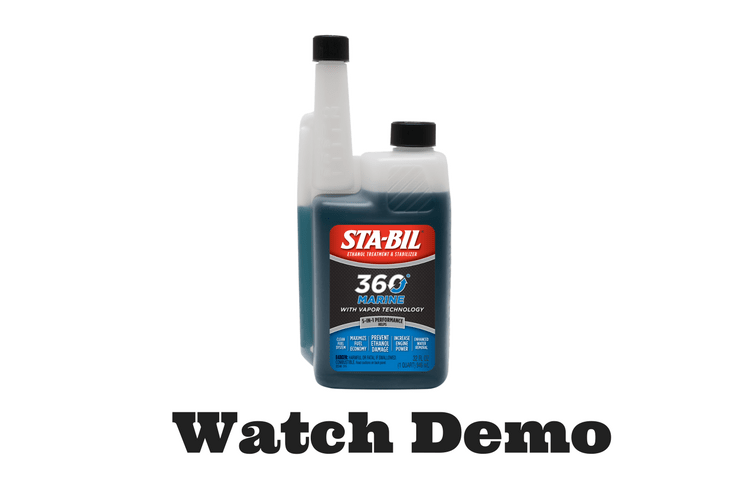 bottle of STA-BIL 360° MARINE treats up to 120 gallons of gasoline. There is also a 40 oz. bottle available that will treat up to 400 gallons of fuel. Use 1 oz. for every 10 gallons of fuel at every fill-up and when storing for an extended period. STA-BIL 360° MARINE is safe to use in ALL gasoline engines, including 4 and 2-cycle, and safe to use in ALL gasoline blends from ethanol-free gasoline to E85. 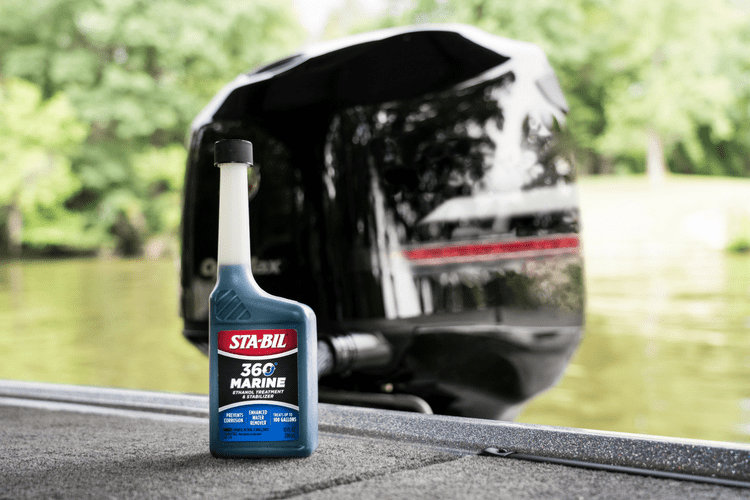 HOW LONG WILL THE VAPOR COATING IN STA-BIL 360°™ MARINE LAST ONCE I POUR IT INTO MY FUEL TANK? Once poured into a tank of fuel, STA-BIL 360° MARINE will provide a vaporized corrosion inhibitor coating for up to 12 months in a stored boat or equipment. However, once a tank of fuel is used up, and new fuel is poured into tank, it will be necessary to re-treat the fuel with 360° Performance. HOW IS STA-BIL 360°™ MARINE DIFFERENT FROM THE OTHER STA-BIL BRANDED PRODUCTS? 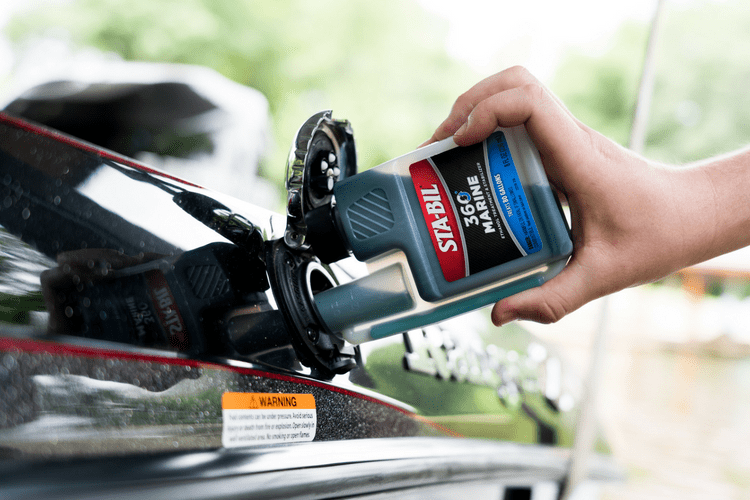 STA-BIL 360° MARINE accomplishes everything our current STA-BIL products offer, including keeping fuel fresh, removing water, cleaning the fuel system and more, but this revolutionary new product provides an exciting new level of protection for ultimate performance. For the first time, STA-BIL 360° MARINE delivers corrosion protection above and below the fuel line by releasing an innovative vapor that coats all metal parts within the fuel system to prevent corrosion. HOW DOES STA-BIL 360°™ MARINE WORK? STA-BIL 360° MARINE offers comprehensive protection by releasing a microscopic corrosion preventing vapor inside the fuel system that coats ALL metals parts, including the fuel tank, fuel sending unit, valves, carburetor, fuel injectors and intake manifold. 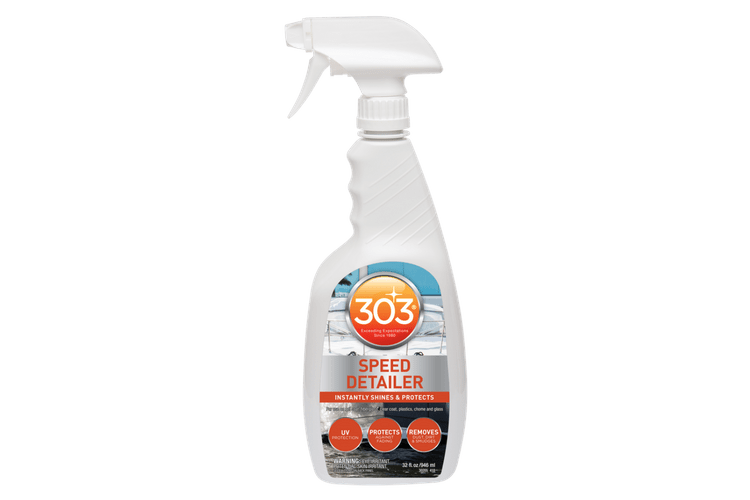 It’s like fogging oil for your entire fuel system, offering “360 degrees” of corrosion protection and is safe to use in all types of gasoline – from ethanol-free fuel to E85. WHAT TYPES OF VEHICLES AND EQUIPMENT SHOULD I USE STA-BIL 360°™ MARINE IN? STA-BIL 360° MARINE can be used in any gasoline engine, including 2-cycle, but is specifically designed for use in boats and other equipment used in high moisture environments. My bottle has turned a brown color - is it still ok to use? Yes, it is normal for the dye of the liquid to change color and this is no indication of the product’s efficiency. 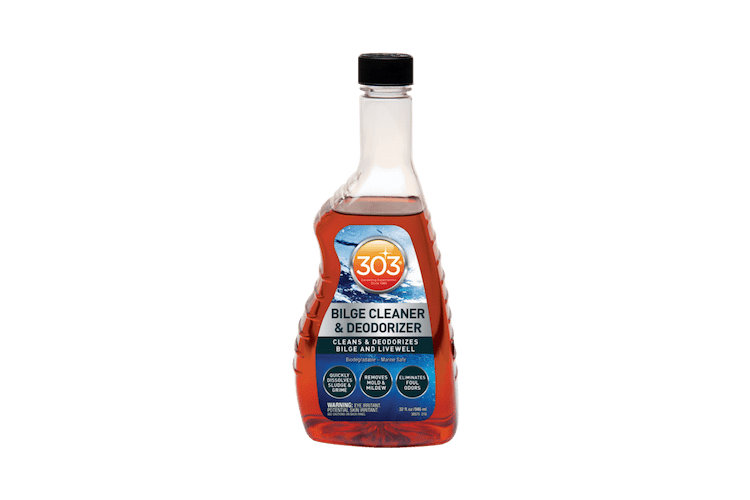 STA-BIL 360°® Marine™ is rated 4.9 out of 5 by 53. 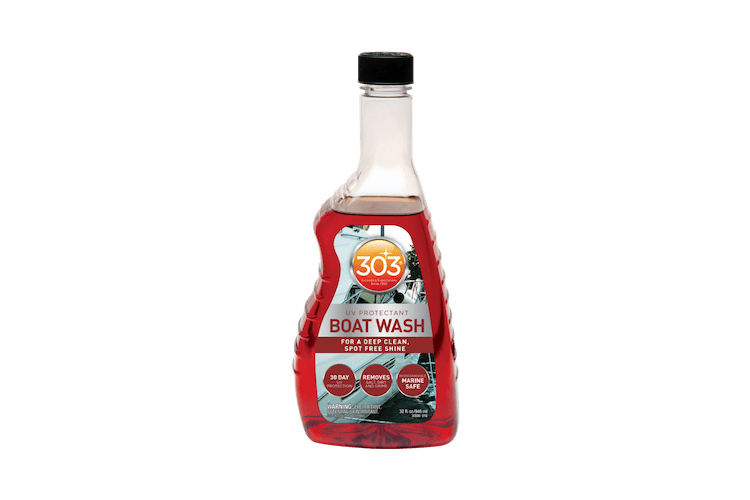 Rated 5 out of 5 by tbwin from great features and benifits I bought this stuff a month ago for my 3 boats. A pontoon, crag cat, and my fishing boat. We are on a private lake and not all of the boats get used daily so the Sta-bil will help keep my gas in these engines fresh all year long. I don't have to worry about the gas in these boats going bad if they are not used often as I would like. None of these boats are new and after I put this Marine Sta-Bil in the gas tanks I have had zero problems starting any of our boats. I believe this product is one of the best in the market and well worth the money. Rated 5 out of 5 by Pflugerjeep from Great Product Made Even Better I've been using the regular red Sta-Bil for years and years now. I've got some gasoline in an engine-drive welder that's been in there over two years and it still starts and runs fine! I know that's NOT recommended, but it just goes to show how how effective this stuff really is. I'm looking forward to even better things from Sta-Bil 360 Marine. I like the idea that the vapor fills the fuel system and helps prevent corrosion from water in the fuel. If this stuff is anywhere as effective as even their regular product, it's going to be a hit! Rated 5 out of 5 by TKwaz from After 2 years in storage I have eight 5 GL containers for the emergency generator. I put about 2 oz in each 5 GL container 2 years ago. Thinking it's time to refresh these, I've put all eight through my car with absolutely zero difference in performance from straight from the pump fresh gas. I was very skeptical and pensive but no more. Rated 5 out of 5 by RW 1 from This stuff works! I have been using Sta-Bil products for years. The first thing I do when I purchase fresh gas is add Sta-Bil. I have never had a fuel related problem running my outdoor power equipment. If you take care of your tools they will take care of you. Some of my friends only use it at the end of the season before they put their equipment away. Use it every time you get new fuel. You'll be glad you did. Rated 5 out of 5 by Autopia Angus from Great for non-marine use too! I used marine STA-BIL every time I pull up my BMW and get gas for my lawn tractor and 2 stroke small engines. I prefer it to the red STA-BIL because the Marine version treats for Ethanol. Great stuff! Rated 5 out of 5 by TexasChris_1966 from Carb and fuel saver for lesser used engines I have an old convertible that spends more time in the garage than out of the garage. Because of life, there are times the car doesn't get driven for 6 months or more. I live in Texas where the fuel additives wreak havoc on fuel systems after a month or two. I have used Sta-Bil 360 for about 5 years and in this time I have not experienced any fuel related issues. before I started using Sta-Bil, I would have to occasionally drain the gas tank and tolerate a rough running vehicle for 30 miles or more until the fuel system cleaned itself out. Rated 5 out of 5 by vetteman04 from Great product. I have been using Stabil in my collector cars and other not used so much vehicles for years. Thought I would try out this new product on the boat. I am very happy with the results as I new I would be.